(CNN) - Chris Christie's jam packed swing through Iowa on Thursday is advertised as being all about the 2014 midterm elections. 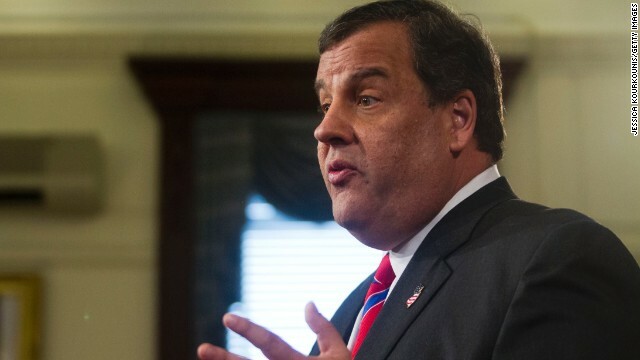 But the visit by the Republican governor of New Jersey and potential GOP presidential contender has plenty of 2016 implications, as Christie tries to get beyond the bridge controversy back home in the Garden State that's diminished his political standing. Christie's heading to Iowa in his role as chairman of the Republican Governors Association. He'll headline a fundraiser for longtime GOP Gov. Terry Branstad, who's running for re-election this year. He'll also help raise money for the RGA and for Republican Iowa House Speaker Kraig Paulsen. Of note, a retail campaign stop with Branstad was added at the last minute to Christie's schedule. The trip is Christie's first this cycle to Iowa, the state that kicks off presidential caucus and primary calendar. While that's raising speculation about Christie's 2016 intentions, a top Christie aide says this trip is focused on November's elections. "This is all about helping Governor Branstad. The two hit it off in 2010, and they have been strong friends and allies ever since. I understand people are taking greater note of this trip than when he goes to Maine or Florida or Arkansas, but Governor Christie's focus is on 2014, and helping Governor Branstad get re-elected," top Christie political adviser Mike DuHaime told CNN. But Branstad doesn't need much help. He's far ahead of his little known Democratic challenger when it comes to fundraising, and polling. The next race for the White House is definitely hovering over Christie's visit. Two days before his visit, a conservative group launched digital ads that slam the potential 2016 contender over his Garden State record on judicial nominations. The Judicial Crisis Network attacked Christie for not making the New Jersey Supreme Court more conservative. Some conservative activists were mad at Christie for his renomination earlier this year of the Democratic state Supreme Court chief justice. That renomination was part of a deal Christie made with the Democratic dominated state legislature that allowed him fill a court vacancy with a Republican judge. "Important issues like Obamacare are at stake in our courts. The next president of the United States may get to appoint as many as three U.S. Supreme Court nominees. A new majority. Call Chris Christie. Tell him to fight for judges who respect the rule of law," says the narrator in the Judicial Crisis Network web ad. While Christie aides were quick to defend the governor's record on judicial nominations, the episode is another reminder that the pragmatic conservative who's willing to compromise with state Democrats to get things accomplished, is anything but a crowd favorite among some on the right. Christie's chairmanship of the RGA was seen as a possible stepping stone to a potential 2016 bid for the GOP presidential nomination. He took over as chairman last November, just a couple of weeks after he was overwhelming re-elected to a second term in Trenton. At the time, was the frontrunner in early polling of the potential field of 2016 Republican White House hopefuls. But six weeks into his tenure as chairman, the George Washington Bridge controversy went viral. State lawmakers and the U.S. Attorney's Office are investigating allegations that top Christie appointees orchestrated traffic jams last September by closing access lanes to the bridge in Fort Lee to politically punish that town's mayor for not endorsing the governor's re-election. Even though Christie has repeatedly denied knowing anything about the gridlock until after it occurred, his poll numbers – both in New Jersey and nationally – took a big hit. But his numbers stabilized, and then bounced back a bit. Meanwhile Christie has continued to travel across the country in his role as RGA chairman, raising a record amount of money for the group and supporting Republican governors running for re-election and GOP gubernatorial candidates. The bridge controversy appears to be far from the minds of Iowa Republicans. "Nobody is talking about it," Iowa Republican strategist Tim Albrecht told CNN. A new NBC News/Marist survey released Thursday indicated that half of Iowa Republicans have a favorable view of Christie, with a third seeing him in a negative way. His negatives were higher in the new poll than those of any of the other potential 2016 GOP White House hopefuls tested. Christie had a 54%-23% favorable/unfavorable rating among Iowa Republicans in a Quinnipiac University poll conducted last month. His favorable/unfavorable rating stood at 49%-14% among Hawkeye State Republicans last July. Albrecht, who served as a top adviser to Branstad, said that "Gov. Christie has always enjoyed a warm welcome in Iowa, and this time will be no different. Iowans take the time to get to know their candidates, learn where they stand on the issues, and make a caucus-night decision based on first-person experiences with these candidates. Should Chris Christie decide he wants to run for president, this visit is a prime opportunity to pick up support, and even if he doesn't run, Iowans appreciate the fact that he's willing to come here and give our governor an assist." GOP consultant Matt Strawn, a past chairman of the state Republican party, said it's an important trip for Christie "because he has not been as frequent a visitor to Iowa as other national figures. Thus, most Iowa Republicans have not yet developed a personal feeling or connection toward him." Except for a first stop in the Des Moines area, Christie spends his day in eastern Iowa, a part of the state that may be more friendly to the New Jersey governor. "Christie is perceived as a fighter. Charismatic. Relatable. A chief executive and a doer. All attributes held in high esteem by many Iowa Republicans, especially those within the business and donor community. The strong response to his upcoming appearances in Eastern Iowa is a testament to that appeal," Strawn added. "His current appeal among the most ideologically conservative of Iowa's activists is more of a mixed bag as those voters remain generally suspect that a Northeastern Republican governor can best represent the party's principles." While Christie's political skills and charisma shine through on the campaign trail, the investigations into the bridge controversy continue, hanging like a cloud over his potential 2016 aspirations. The scandal, and the Garden State's budget woes, would give possible rivals to the GOP nomination plenty of ammunition to attack Christie. Christie's swing through Iowa comes two weeks before he headlines a Republican party fundraiser in New Hampshire, the state that holds the first primary in the primary and caucus calendar. It's his second trip to the Granite State in the past month. Christie says he hasn't made up his mind about running for president. "I'm in no hurry to make those decisions," he said Wednesday in an interview on CNBC. "I have a pretty good day job as governor of New Jersey." "The fact is that you should beware of people in my opinion are overanxious to make that decision before they need to," Christie added. "That would seem to indicate to me ambition over wisdom, and I don't think that's what you want in the person sitting in the Oval Office." Any major politician who's visiting Iowa at this point must be thinking about the 2016 nomination. Same goes for New Hampshire and South Carolina. Christie knows exactly what he is doing and will do. Statements like his " ambition over wisdom" go a long way to proving this. He's showing us his "wisdom" right now. Rand Paul and the yahoo from Texas are the rivals who are "ambitious"! He's NEVER going to get past the bridge gate scandal. He doesn't seem to be spending that much time in his state of NJ. What is he afraid of? That when the come get him the authorities will have to go hunting for him? Who cares? Really can't wait to see Thad Cochran,Kevin McCarthy,Thom Tillis,Sheldon Adelson,Rupert Mourdoch,Karl Rove,Lindsey Graham,John McCain,Susan Collins,Hayley Barbour,Grover Norquist and the GOP stuff Jeb Bush down the tea party's throats EXACTLY like they stuffed Romney down. Straight no chaser. Hillary will drink to that! Chris Christie isn't going to fair any better in the Republican Presidential Primaries than Rudy Guiliani did in 2008. The more you find out about this guy, the worse he looks, he's a typical gop, gives tax breaks to big business, jobs don't ya know, that's the same BS that they all use, where's your jobs at Christie, your state ranks 48th for total health, just the guy we need to ruin our nation. But Obama's policies are all failures, well if your goal is to further enrich the 1%, that took 95% of all wealth, than yes, his policies failed to do that, poor billionaires, how will they survive? The gop answer to all our nations ills, tax breaks for the rich and big business, less rights for you. And it worked so well when bush did it, why doesn't everyone want to do it? The bridge scandal is irrelevant. Northeast Republicans tend to not do well in Republican presidential races. Look at what happened to Rudy Guiliani in 2008. If "America's Mayor", for goodness sakes, couldn't make it past the Florida primary, what makes anyone think Christie could do any better? Oh, but Mitt Romney won the nomination some folks will say. Yeah, he did. But, Mitt Romney was born in Michigan and viewed more as a Utah Mormon than a former Massachusetts Governor. Like Guiliani, who was in New York, Christie is New Jersey born and bred, through and through. In other words, Yankees don't make good Republicans. The right wing's "trickle down economic' theory that Reagan introduced to us is nothing more than a Trojan Horse. It's sole purpose is to reduce the personal taxes on the wealthy and corporate taxes on big business. While the tax cutting policies have produced apparent economic prosperity, they have never delivered on the jobs that were promised. Ronald Reagan's own former economic adviser has called trickle down a Trojan Horse. Why should the tax cuts produce jobs for the middle class and the poor, anyway? Wouldn't a trickling down of the wealth constitute a "transfer of wealth", which the right wing so vehemently despises? Of course, it would. Do they care about that hypocrisy? Of course not, even if it was pointed out to them. He runs, he loses. This man stands absolutely no chance at all of getting elected in 2016. He's never going to beat Hillary, in a contest for the White House. Bet against her winning. If you do, I hope you wager every dime you can get your hands on. You'll be on some form of social program, just to get enough food to survive. "While Christie's political skills and charisma shine through on the campaign trail ... "
Yes, well. I'm not seeing either skill or charisma, but it might just be me. Fact is, I find the man to be a boor. New Jersey got a heck of a governor, he can govern from everywhere but his own state evidently, sad truth is, the more time he spends away, the better off they are. The clocks ticking Chris, when are you going to announce the bad Democrats are after you again, requiring him to spend more of n.j. tax dollars to defend himself, and I'm going to predict they find he did nothing wrong, again. Talk about buyers remorse, holy crap this guys a disaster for the working class in his state. Christie, and Jersey are the perfect example if why we can't afford another gop in charge, he implemented the typical trickle down economics, and look at how well it worked for the working people of n.j., 48th in overall health, no jobs, education gutted, misappropriations galore, sabatoge every project you don't like, use the money how ever you want(tax cuts for rich, big business), and lie when caught call it a witch hunt, make the citizens pay for an entire legal team, who will inevitably find him innocent, how many times does it take before you vote him out. He is poison for the common man, and that's a fact. Yes, well. I’m not seeing either skill or charisma, but it might just be me. Fact is, I find the man to be a boor. Ditto my friend....😊😊😊 Good morning..
Have you seen the new GOPT strategy against Hillary?? They're pushing Elizabeth Warren. They're hoping she is able to do what President Obama did to Hillary in 2008. Have you noticed all of the Elizabeth Warren praise from the right? They're pushing for her because they believe they can beat her and know Hillary will be harder to beat. They are a really conniving group of people. The fact that they think they're so damn clever is making me really throw my support behind Hillary. If Warren gets the nomination, they will destroy her with their lying ads and 24/7 Fox bashing. They're running out of ammo to use against Hill. "The fact that they think they're so damn clever is making me really throw my support behind Hillary. If Warren gets the nomination, they will destroy her with their lying ads and 24/7 Fox bashing. They're running out of ammo to use against Hill." Just like you, it amazes me that these folks can't see through their own self worship. The MSM is picking up on it as well. I truly worry about our media. If they are so indebted to the Republican party that they continually spread one GOPer talking point after another suggests there is no hope for America going forward. That they, too, can't seem to understand they are as duplicitous as the GOP is equally mind boggling. I'd be mighty disappointed in Warren were she to accept the bait and run with it. Pulling her out of the water would be child's play for the GOP. "Have you seen the new GOPT strategy against Hillary?? They're pushing Elizabeth Warren. They're hoping she is able to do what President Obama did to Hillary in 2008." Hello, you have reached the psychiatric hotline. If you're obsessive compulsive, press 1 repeatedly. If you're schitzophrenic, have one of you press 2. If you're paranoid delusional, don't do anything. We know who you are and what you want. Fair, are you undecided on what number to push? Just like you, it amazes me that these folks can’t see through their own self worship. The MSM is picking up on it as well. I truly worry about our media. If they are so indebted to the Republican party that they continually spread one GOPer talking point after another suggests there is no hope for America going forward. That they, too, can’t seem to understand they are as duplicitous as the GOP is equally mind boggling. I’d be mighty disappointed in Warren were she to accept the bait and run with it. Pulling her out of the water would be child’s play for the GOP. I agree about the MSM. All the headlines and stories are so one sided and full of innuendo that it is scary. They are completely beholden to the GOP. Have you noticed how absolutely silent they've been about the fact that Ted Cruz was not born on American soil? They ran like track stars with the Obama was born in Kenya stories for years. But what have we seen in regards to Cruz? One lousy article. The MSM is pathetic. I guess that's why I watch BBC and PBS. Have you seen the new GOPT strategy against Hillary?? They're pushing Elizabeth Warren. A big , boring, boor. Yes we've all noticed that. And reeeking of "we-ain't-got-squat-to-beat-you-with" desperation. They are also doing their best to gin up the Latino voters AGAINST Obama, and therefore the Democratic candidate for 2016, by doing their best through innuendoes and deception to dump this illegal immigration problem solely on the President's lap. This is what the GOP has devolved into: a Party that lacking a viable Presidential contender will stoop to anything and stop and nothing to keep folks from realizing that they've got NO ONE and NOTHING to offer. If you’re obsessive compulsive, press 1 repeatedly. If you’re schitzophrenic, have one of you press 2. If you’re paranoid delusional, don’t do anything. We know who you are and what you want. Nah... it just amazes me that those who accuse people of being conspiracy theorists come up with some doozies of their own. Lighten up, by the way. Charisma? Is that the new word for him being a loudmouth bully?